The purpose of this project is to create a belvedere, incorporating free-time facilities, a drainage system, a small dock for kayakers. The area, despite its panoramic character, is currently abandoned. 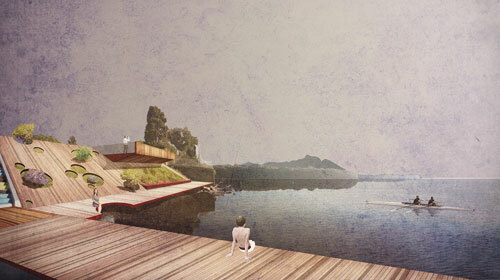 The project consists of a wooden surface that follows the orography of the shore, and bows out by generating specific locations/functions: a belvedere, a small botanical garden, benches, and a movable dock, which rises according to tides.